15,000 SOUTH AFRICANS MOVING TO RUSSIA TO FLEE PERSECUTION? This is the kind of story that the politically-correct media is highly unlikely to cover, so I thought I’d bring it to readers’ attention. Amidst worsening persecution, violence and even murders against white South African farmers, some are seriously starting to consider moving to Russia to seek safety. The three links below reporting this story are from the South African, Israeli and Russian media. 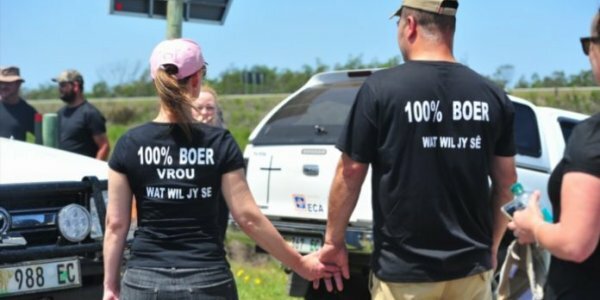 Where is this contingent of Boers considering emigrating to start over? To Russia! Russia reportedly has excess farmland that needs to be brought into production and the Boer South African population is very skilled at farming. The links report that Russia may welcome them and that each emigrating South African farmer family will move the equivalent of $100,000 to Russia when they move to finance their start-ups in Russia’s farming region. Be sure to watch the embedded video in the links below showing an advance delegation of Boer families touring Russia to evaluate the migration of white South Africans to Russia. Russia has a declining population so it is likely to look favorably on an immigrating population which has highly-developed agricultural skills. I think one conclusion is obvious if a migration of white South Africans moves to Russia. Russia’s food production will steadily rise and South Africa’s food production will steadily decline if this happens. It should be realized that if 15,000 Boers move to Russia, it will only be “a drop in the bucket” compared to the overall population of the Boers. The fourth link is from an authoritative reference source which estimates that there are 2.6 million Boer people in Southern Africa. If the rest of the Boers stay and fight, South Africa may find itself in a civil war with ghastly ramifications. In Matthew 24:6, Jesus Christ prophesied that “wars and rumors of wars” would characterize the times just prior to his return. The threat of a civil war in South Africa is currently a “rumor of war.” Let’s hope that this violence against Boer farmers ends and that this situation has a peaceful resolution. Finally, I must point out that in my books, I identify many of the white population of South Africa as being members of the Israelite tribe of Asher. Since the Boer population includes Dutch, German and other peoples, their numbers would also include some people from the modern Israelite tribes of Zebulun and Gad. If you refer to the “Articles” heading at my website’s homepage, you can scroll down and see articles about the Israelite tribes of Benjamin, Ephraim, Manasseh, Judah, Gad, Issachar and Simeon. My books detail the history of all the tribes of Israel from ancient biblical times up to and including modern times. My books utilize exhaustive evidence from secular historical sources as well as biblical prophecies and narratives. Readers are also encouraged to read my articles, The United States of America in Biblical Prophecy, and Are We Living in the Biblical Latter Days?. Once you understand the true history of the ten tribes of Israel who were exiled from the Promised Land in the 8th century BC and where they are located today in the modern world, your understanding of the flow of history and hidden facts underlying modern geopolitics will be greatly expanded and you will be able to see the Bible has to be the word of a Creator God to be so accurate over the millennia.